The 2160p high definition video quality is much kinder to The Dark Knight than it was to its predecessor, Batman Begins. The special effects are so well done that you can’t see any flaws in the upgrade to 4K. With the success of Christopher Nolan's (Dunkirk) reimagined version of Batman in 2005's Batman Begins Warner Bros. decided to green light his second installment, The Dark Knight, which was released 3 years later. Once again Christian Bale (American Psycho) reprised his role as Bruce Wayne though this time we see a more mature and collected character than we did the first go around. The Dark Knight also follow's Nolan's earlier vision of a different type of Batman – one that is much more flawed. He also continues with a more adult version of the caped crusader as opposed to his predecessors who tended to trend towards a more cartoonish feel to their films of the Batman story. Nolan's version also lends itself to the 4K upgrade as his special effects are very well done. In continuing the story set in Batman Begins we see Bruce Wayne re-establish himself as the head of Wayne Enterprises while he "moonlights" as Batman, trying to rid Gotham City of crime and evildoers. He meets his biggest challenge when the Joker (Heath Ledger; Brokeback Mountain) carries out a series of crimes including bank robber. The Joker then makes a deal with various mob bosses to kill Batman in exchange for half their money – a deal to which they reluctantly agree after The Joker kills crime boss Gambol. Batman eventually forms an Alliance with District Attorney Harvey Dent (Aaron Eckhart; Olympus Has Fallen) and Lieutenant Gordon (Gary Oldman; Harry Potter and the Prisoner of Azkaban) hoping to stop crime and in an effort to be able to give up his alter ego for good so he can have a normal life with Rachel Dawes (Maggie Gyllenhaal: Crazy Heart), his childhood love. In the end, Batman takes responsibility for Dent's killing spree - who turned evil after The Joker killed Dawes. Once again Nolan assembles an incredible cast to surround Bale. Eckhart and Oldman are excellent and the three seem to build a rhythm as the trio aimed at saving Gotham City. Eckhart is especially good once he flips the switch to become the evil Two-Face villain. I'm not sure why Katie Holmes (Dawson's Creek) didn't reprise her role as Rachel Dawes and I'm not sure Gyllenhaal was the best choice to take up the reigns. I don't see as much chemistry between her and Bale as I did the former. Of course, the Stand out in this movie is the late Ledger. His Joker will go down as one of the most unique and sinister renditions of this character but, sadly, perhaps his performance was enhanced by is personal issues that ultimately led to his death. We will never know for sure. The 2160p high definition video quality is much kinder to The Dark Knight than it was to its predecessor, Batman Begins. The special effects are so well done that you can't see any flaws in the upgrade to 4K. Everything is sharp and the blacks are deep and true, which works especially well for a film such as this one. The audio is limited to the DTS- HD Master audio 5.1 instead of Atmos but it is clean and crisp regardless. The dialogue sits nicely in the center channel while the explosions and gunfire are relegated to the surrounding channels. The combo pack has over three hours of extras spread over two discs. These include: Gotham Uncovered: Creation of a Scene, Batman Tech, Batman Unmasked: The Psychology of The Dark Knight, Gotham Tonight and The Photo Galleries. While long they offer tons of inside information about the character and the making of the film. Although heavy on plot, The Dark Knight is considered to be one of the best Batman films ever made. It all fits together nicely as puzzle pieces forming the whole picture. The cast, effects, story, and direction just seem to work making this 4K a must-own movie. 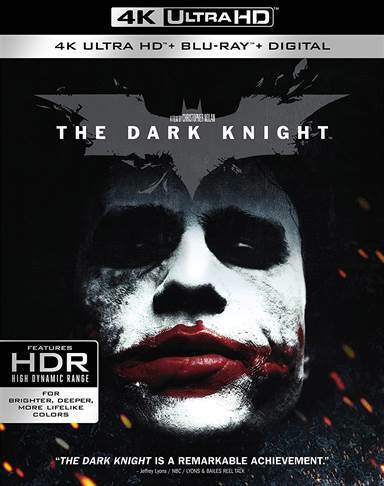 Download The Dark Knight from the iTunes Store in Digial HD. For more information about The Dark Knight visit the FlickDirect Movie Database.